Australia recently made legal changes that undid the damaging & limiting definition of marriage as only possible between a man and a woman, allowing thousands more diverse couples the right to marry. 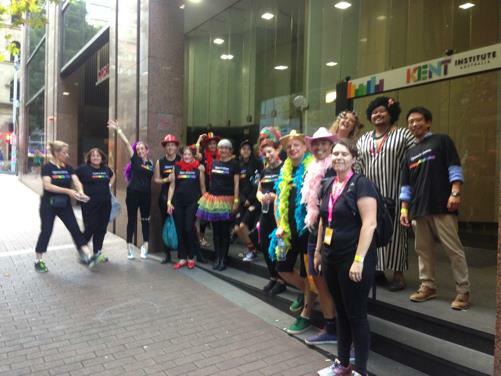 On Saturday, March the 3rd, a contingent of 50 staff members from across Australia, their friends and family members represented Relationships Australia in the 2018 Sydney Gay and Lesbian Mardi Gras. It was a celebration of 40 years of pride and protest. A spectacular night we will remember, not only for its nearly 200 incredible floats, outrageous costumes and party vibe, but for what it means to us all. 12,000 adoring souls who know to praise this life we have, came together. Marching with my RA family & held by the wider community of countless happy queer families & so many loyal straight mates, I felt elated. Even walking towards the start of the parade, the streets were abuzz with excitement & the message became clear. I am okay. You are okay. We are each unique. No need for fear, just celebration here! It was simply wonderful to be among so many adults who remember how to play. Play is important for self-esteem & healthy relationships. Joy spread everywhere as people opened up to celebrate their own unique gorgeousness. This collective energy creates an invitation to each one of us to be bravely who we truly are without shame or fear, without judgement of others. Cinderella sings “You don’t know what you’ve got until it’s gone.” The same is true of negative experiences. 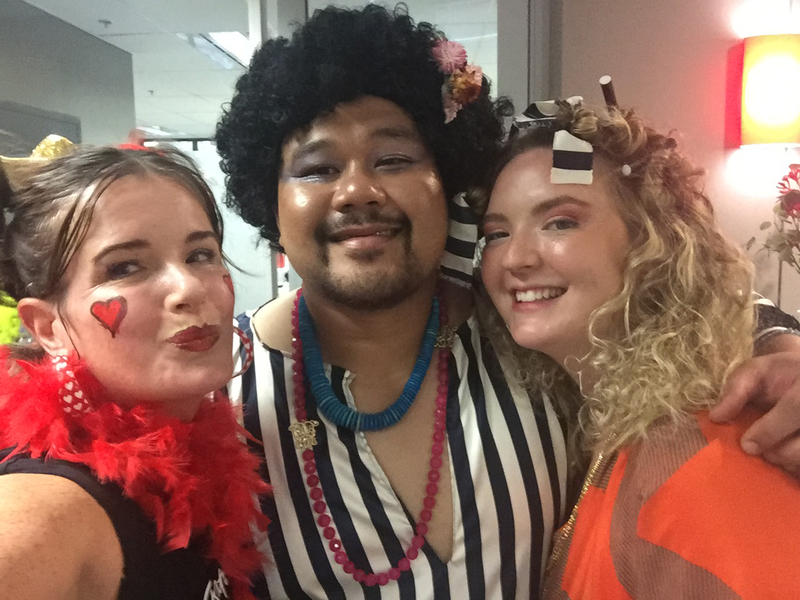 Despite the challenges of growing up queer, I consider myself very lucky & doing well in life for several years now, but the higher level of acceptance I experienced at Mardi Gras highlighted an undercurrent of slight fear and self-protection, a mode we are often in without realising it. It is a stress we live with and many minorities live with. Celebration of diversity is a panacea to conformity & control. Events like this can have a transformative effect for people’s lives. The diversity was startling & inspiring. I witnessed you, multifarious, each unique in your beauty. You fluffy wolves, you leather dogs, you bears & butterflies, you women with strong arms & clever minds, you hairy beautiful dress wearing beings, you old wise ones playing music, you fairies, you inflatable dinosaurs, tin man & Wonder Woman you lions & fauns you man-woman, you hairy beautiful…. you love huge – all of you. Being in Mardi Gras was a peak experience. It was exhilarating. It made my year. We wore shining rainbow capes. We skipped & danced along the street together waving & blowing kisses to a loving crowd of over 500,000 people. The lived experience of so much acceptance travels with me now. On the night all the people who came up and spoke to us were very thankful for the kind support Relationships Australia has pro-actively given so many queer people over the past 40+ years. 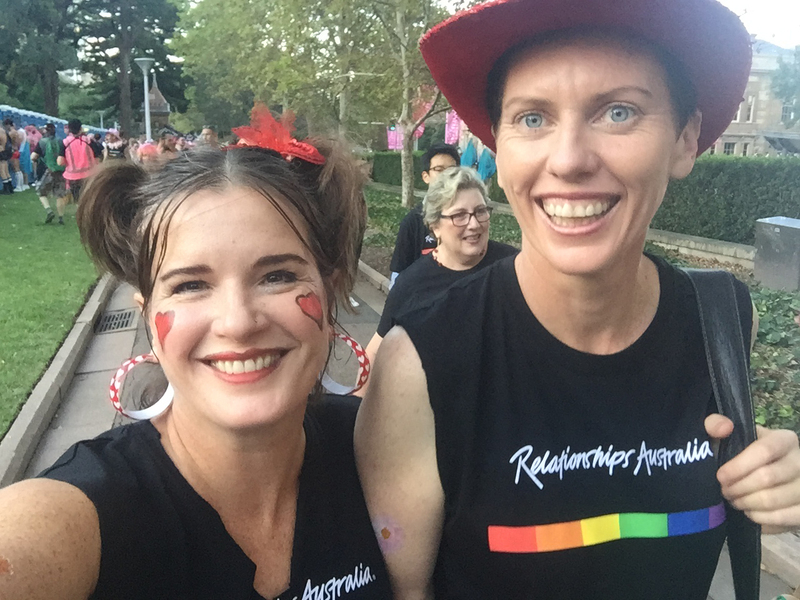 THANK YOU Relationships Australia – You Rock!!!! This entry was posted in Uncategorized on March 15, 2018 by Tracey O’Driscoll.